Abema TV is hosting first retweet based general election for Sword Art Online this month. The character that receives the most retweets will be crowned the winner and become the focus of a smartphone wallpaper. Abema TV will announce the results on October 6. It would appear that Asuna is a shoo-in to claim the prize. She’s topped Newtype rankings for best female character in the past. Abema’s poll, though, is revealing some surprises and Asuna could be unseated as the franchise ‘s best heroine. The streaming service’s Twitter account announced the intermediate results of the poll and Asuna is in third place with 1,345 points. She’s trailing behind both Sinon (who has 2,145 points) and Yūki (who has 2,243). The race seems much closer between the first and second place. 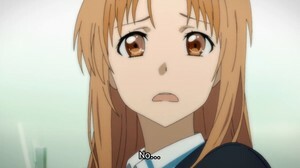 Asuna fans will really have to push through if they want their leading lady to recover. All three girls are ahead of Kirito, who is sitting in fourth place, followed by Silica, Leafa, and Yui. The campaign has garnered 11,000 retweets as of Tuesday. Series fans seem to be participating in good faith this time around. Another character poll run by Dengeki Bunko that would decide the characters that would appear on the cover of abec ‘s Sword Art Online artbook saw enthusiastic pranksters writing in Kibaō in an attempt to get the minor character front and center. The internet streaming service Abema TV is one Japan’s best sites to catch up on anime, watch live-action adaptations, and surf original programming. The site followed one of Japan’s top cosplayers to reveal her salary and work schedule and it hosted the live stream for the recent “Magia Day” event celebrating the Magia Record: Puella Magi Madoka Magica Gaiden smartphone role-playing game.